Led by Jairam Thakur, the BJP stormed to power for the first time on its own in the hill state in 2007 and Prem Kumar Dhumal became the chief minister. Known for his integrity, Jairam Thakur enjoys a good rapport with his voters. 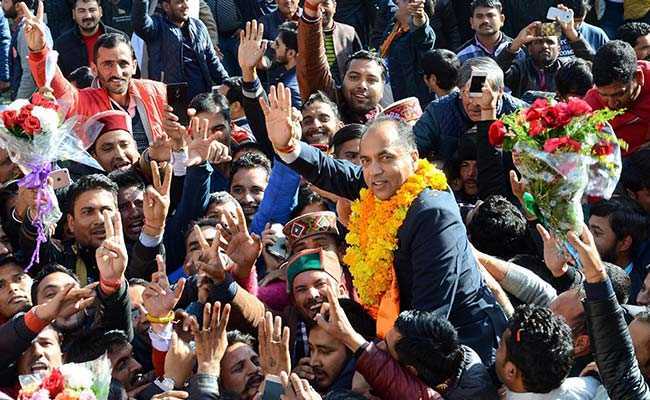 Shimla: Soft-spoken, low profile organisation man Jairam Thakur was just 28 years old when he first contested the state Assembly elections from Chachiot in Himachal Pradesh in 1993. He lost by a slender 800-vote margin but caught the attention of the BJP's top brass. In 1998, Mr Thakur contested from the same seat, won, and then went on to convert Chachiot (renamed Seraj after delimitation in 2010) in Mandi district into his bastion, winning it a record five times in a row. It was this ability to nurture and consolidate a support base that held the BJP in good stead during the 2007 Himachal Pradesh Assembly polls which the party contested with Mr Thakur as its state chief. Led by Mr Thakur, the saffron party stormed to power for the first time on its own in the hill state and Prem Kumar Dhumal became the chief minister. Mr Thakur served as rural development and panchayati raj minister in the Dhumal government from 2010 to 2012. However, it was Dhumal's shock defeat in this year's Assembly polls that the chief ministerial race in the state was thrown open and Mr Thakur emerged as the natural choice, despite the names of several tall leaders, including Union minister J P Nadda, doing the rounds. Mr Thakur will be the first legislator from Himachal's second largest Mandi district to become chief minister. The BJP created a record by winning nine out of ten seats in Mandi district in the 2017 state polls. Known for his integrity, Mr Thakur enjoys a good rapport with his voters and the remoteness and difficult topography notwithstanding, got 56 out of 58 panchayats in Seraj constituency connected by road. During student days, Mr Thakur was a dedicated activist of the ABVP, and is known to be close to the RSS. In Shimla, the atmosphere turned festive as supporters celebrated his elevation, bursting into song and dance the moment the 52-year-old Rajput leader's name was announced. Mr Thakur will be the sixth leader of the state to occupy the chief minister's office and the 14th chief minister of Himachal Pradesh. Earlier Dr Y S Parmar, hailing from Sirmaur, was elected chief minister in 1952, 1963, 1967 and 1972 while Ram Lal from Shimla remained the chief minister for three months from January 28 to April 30, 1977. Shanta Kumar from Kangra district remained chief minister from June 21, 1977 to February 14,1980 as Janta Party leader and again from March 5, 1990 to December 15, 1992 as BJP leader. Congress leader Virbhadra Singh from Rampur in Shimla district was chief minister from April 8, 1983 to March 5, 1990 , from December 3, 1993 to March 24, 1998. He again served as chief minister from March 6, 2003 to December 30, 2007 and December 25, 2012 till date. BJP leader Prem Kumar Dhumal from Hamirpur served as chief minister from March 24, 1998 to March 5,2003 and again from December 30, 2007 to December 25, 2012.